When Atlantis and its culture was about to decline some became dolphins in order to save their knowledge and keep themselves safe from those who led the culture. Atlantis shifted its lee of existence, is now in another dimension. The Atlantian Dolphins want to bring the knowledge of Atlantis back into our hearts. They are highly developed beings and the guardians and angels of the seas who offer their loving help and support, teaching us to see the truth as we journey to another reality. Do you feel attracted by Atlantis, do you feel in your heart the longing for Atlantis and Lemuria, are you ready for this journey? 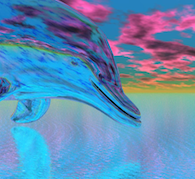 The crystalline and bright energy of the dolphins awakens the atlantic consciousness within us s they support us and bring us connection with the enormous potential energy of the atlantic crystals. This manual includes a channeled meditation that helps you to come into connection with the enormous potential energy of these crystals. Everyone who becomes attuned to this wonderful energy will experience an instant rise of the vibration of the light-body, making it easier to contact higher levels and learn from the dolphins. You will receive exactly the amount of energy you need at the moment. After receiving your attunement to Atlantian Dolphins you are able to charge crystals with the energy, the most suitable being larimar, but you can use rock crystal as well, and may also charge other kinds of objects too. This system can be used both for your self and others and includes one symbol. There are no prerequisites for attunement to Atlantian Dolphins but knowledge about energy work is beneficial.